Italy's president, prime minister and senior intelligence officials have attended the funeral of an intelligence agent shot dead by US forces in Iraq. Nicola Calipari was killed by US troops as he escorted a released hostage, reporter Giuliana Sgrena, to freedom. 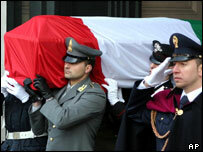 Thousands of Italians crowded into Santa Maria degli Angeli church in Rome for his full state funeral. The US dismissed as "absurd" Ms Sgrena's suggestion that the US troops may have deliberately targeted her car. "It's absurd to make any such suggestion, that our men and women in uniform would target individual citizens," said White House spokesman Scott McClellan. US authorities have pledged to carry out a thorough investigation. The incident has strengthened Italian opposition to the continuing military presence in Iraq. Six in 10 Italians now think the war was wrong. Hundreds of Italians lining the streets applauded as the cortege approached the packed church. Mr Calipari's wife and teenage children, who sat at the front, were comforted by President Carlo Azeglio Ciampi and his wife before the ceremony started. Ms Sgrena, who is in hospital recovering from her shrapnel wound, said she was very sad not to be able to attend the ceremony. Mr Calipari has become a national hero and many of those who came to pay their respects hailed his bravery. He was killed on Friday evening in disputed circumstances as he made the journey towards Baghdad airport with Ms Sgrena, who had been held captive for over a month. He was hit as he shielded Ms Sgrena from shots fired towards their vehicle by US forces. Doctors said he was struck in the temple by a single round and died instantly. Correspondents say the death of Mr Calipari, who led the negotiations to free Ms Sgrena has clearly dealt a heavy blow to Prime Minister Silvio Berlusconi, who is considered one of US President Bush's staunchest allies in Europe. In several interviews to Italian and foreign media outlets, Ms Sgrena said she believes US troops might have deliberately opened fire on the car. Ms Sgrena, who works for communist paper Il Manifesto and has always been an outspoken critic of the war, argues that US authorities strongly oppose the kind of negotiations conducted to free her. "I cannot rule out that I was the real target," she told Rome-based daily La Repubblica. Mr Calipari was a highly experienced hostage negotiator and intelligence official who had helped secure the release of two Italian aid workers taken captive in Iraq. President Bush phoned Prime Minister Berlusconi after the incident to express his regret, a White House spokesman said. The US military said troops fired on the speeding car after it failed to stop. In a separate development on Monday, Bulgarian Defence Minister Nikolai Svinarov said a Bulgarian soldier killed in Iraq on Friday was almost certainly shot by US troops. Mr Svinarov said a Bulgarian patrol had fired in the air to warn an Iraqi driver to stop, but had then come under heavy fire from the direction of a US communications post 150m (500ft) away.